Created on Monday, August 18, 2014. 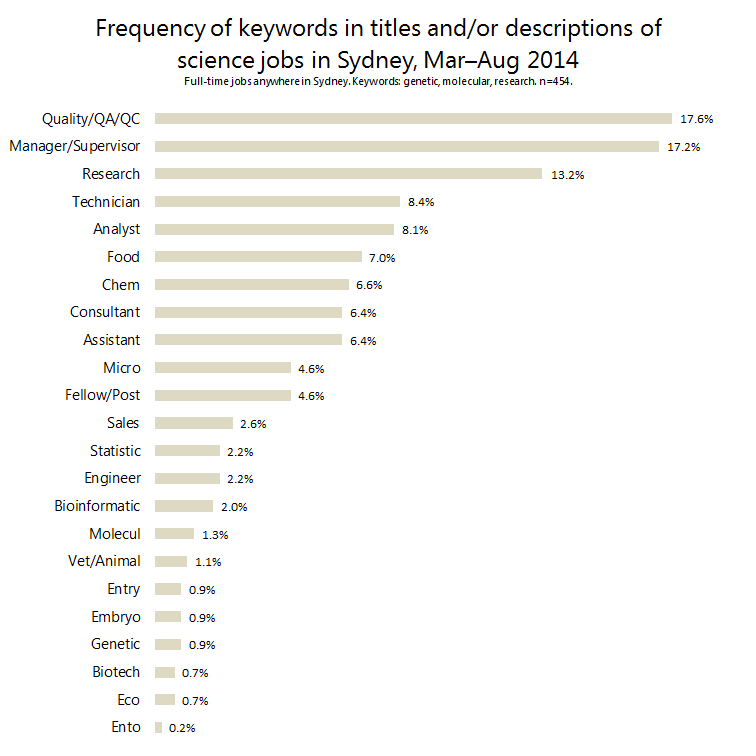 I gathered science job ads for 5 months and looked for trends in job types and locations. Download my data: .xlsx or .csv. I wanted to have some data on the state of the job market before deciding whether to do a science PhD or not. I had reservations about how many postdoctoral positions were out there, how many entry-level jobs, whether research jobs were common or if it was all Quality Assurance, that sort of thing. Anywhere within the Sydney Metro area. Keywords: Any of research, genetic, or molecular. Today (18 August 2014), I compiled all of these emails, filtered out the duplicate job listings, and was left with a total of 454 job listings over this 5-month period. Here‘s what I found. Non-research jobs dominate the job market. By non-research, I mean Laboratory & Technical Services and QA/QC, which make up more than a third of the total jobs. Management and supervisory positions are interspersed through every category, but are most common in Food Technology and Safety. Most research jobs are located around the CBD. Most technician jobs are in Western Sydney. 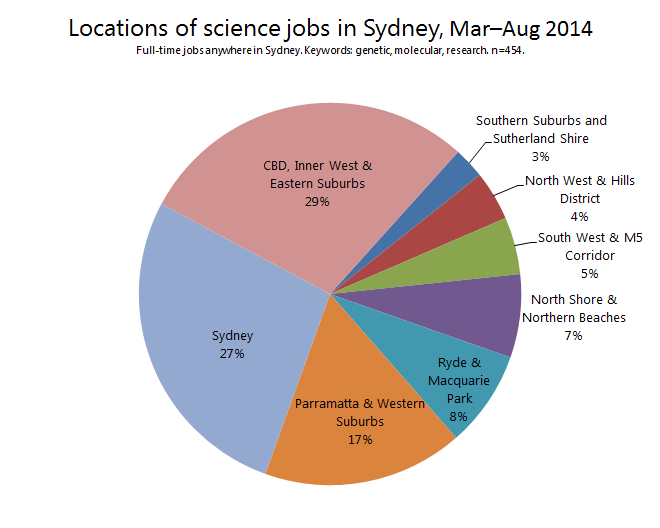 Science jobs are most common towards the CBD. Between the east and west of Sydney, there’s a sharp divide in the type of job available: Most research jobs are located the east (CBD and surrounding area), and most non-research jobs Quality Assurance, Technical Services, and administrative roles are in the west (Parramatta and Western Suburbs). 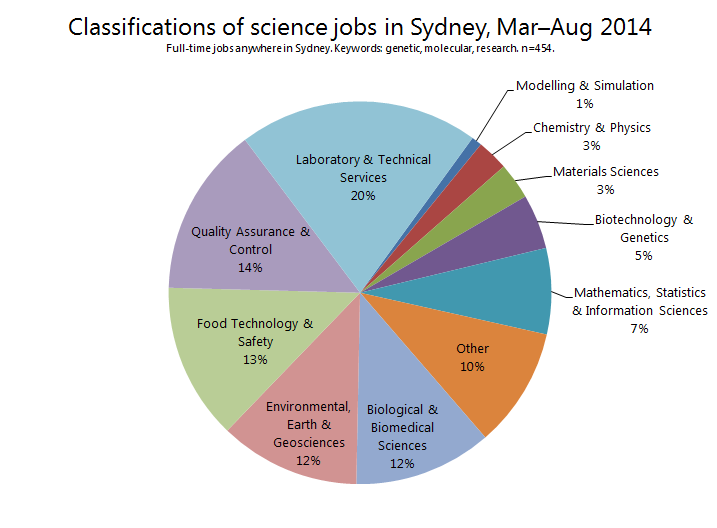 I don't have a more granular breakdown of Sydney, but I would bet that there’s an east-west gradient with science jobs being most plentiful at the coast and sparsest at the mountains. QA jobs are very common. Animal jobs are very rare. There are about twice as many technician jobs as post-doc positions. This graphic shows how many job listings contain a particular keyword in their job title or job description, as a percentage of the total 454 listings recorded. One job can appear in multiple keyword searches. Again we see non-research jobs chewing up a third of the pool, but research jobs are surprisingly not too far behind. These are jobs as investigators, post-docs, or research assistants. In the way of post-doctoral positions, they’re still rare but not as rare as I expected. Perhaps when the anti-science political climate here improves, those numbers will improve as well. One can hope.